Today we publish a remote control applicaiton for Kidlogger PRO for Android. This applicaiton is designed for the parents, who installed KidLogger PRO application on their child's phone. It can show what is going on with the child in real time. It uses invisible SMS commands to contact KidLogger PRO application, so it can work without Internet connection. Install Kidlogger Remote control tool from here. In main window you can see several commands. First you need to configure the application and establish a connection between your phone and child's one. 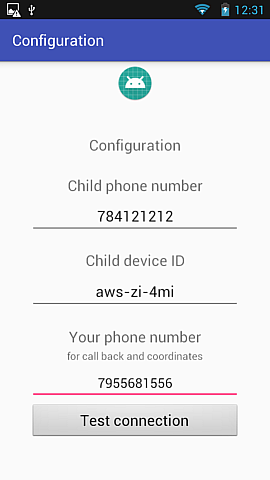 Click Configuration button and write your child's number, device ID and your own phone number. Use the number, where you have more money, because this application will spend it for SMS messages. Click Test connection to establish it with child's phone. If the application of Kidlogger PRO (from 1.6.112) is active there the connection will be OK.
What's going on command will inform you what application is currently active on target phone. 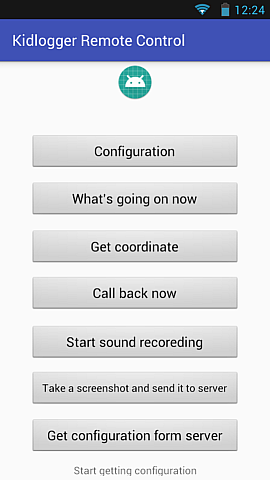 Get coordinate will inform you about a current coordinate of the phone. The Location services should be switched on on target phone. By clicking the link on info box you can see the location of target phone in Google Maps. Important: the target phone may be in sleeping mode. To wake it up previously click Call back now, but don't answer the call. Call Back Now - target phone will automatically perform a call to your phone and you can hear what is going on arownd the phone. Important: This call will be performed only if the target phone is not in active mode. Start sound recording - KidLogger PRO applicaiton will start recording surrounded sound and will send it when Internet connection appears. Take a screenshot and send it to server - target phone will perform a screenshot and will send it to server when internet connection appears. Get configuration from server - If you cahnged settings for this device on server and need to apply them right now, click this button. We are waiting for your proposals: what other features you want us to add into this program. Use our contact form to share your ideas. 1. command sending will spend the money(one command = one SMS), depending on your local tariff. 2. SMS messages are not saved in phone's memory. We elaborated a special procesure to increase the confidentiality. 3. It is not recommended KidLogger PRO to be installed on parental phone, along with KidLogger Remote Control applicaiton.